The view from the author’s triangular-shaped window looking northwest towards the southern slopes of the North Massif taken shortly after landing in the Valley of Taurus-Littrow. The distance to the base of the mountain is ca. 3.5 km. The inverted metallic cone right of center is one of sixteen 50 lb thrust attitude control thrusters used in flight. (NASA photo AS17-147-22472). 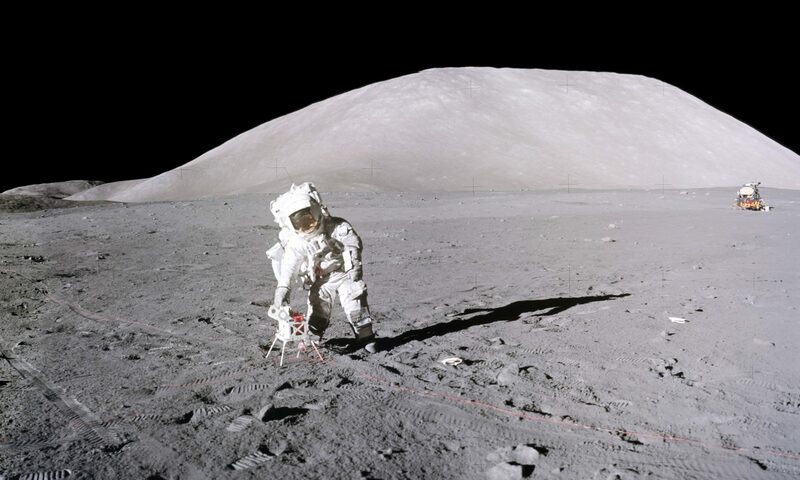 “The 12th Man” constitutes the third installment of Apollo 17: Diary of the Twelfth Man, commemorating the 45th Anniversary of the December 7, 1972 launch of the Apollo 17 Mission. It is Chapter 9 of the Diary with other chapters to follow as soon as time permits, some out of sequence like this one. This chapter chronicles the moments after touchdown of the LM Challenger in the Valley of Taurus-Littrow; safing the spacecraft systems and preparing it for an extended stay; the first views of the surface from the windows; donning the spacesuits; and stepping out onto the lunar surface for the first time. To continue reading, click “7. Chapter 9…” under the main header in the “Pages” sidebar at upper right, or here.